Cymbals Eat Guitars put out their great third record, LOSE, earlier this year, which is starting to land on year-end lists like Jeff Rosenstock’s. The band also gave us their own list of their favorite albums of 2014, which includes Foxing (who joined them on their tour with Brand New), Joyce Manor (who also toured with Brand New this year), Alex G (who’s opening CEG’s upcoming tour), Beyonce‘s late 2013 release and more. Check out their whole list, with commentary, below. 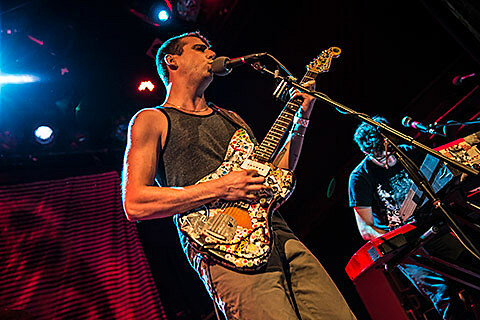 That Cymbals Eat Guitars/Alex G tour begins next week, coming to NYC on December 12 at Knitting Factory. Tickets for that show are still available. Updated dates are listed below. CEG have also reissued their 2009 debut, Why There Are Mountains, which was initially self-released, on their current home of Barsuk Records. You can pick that up on vinyl here for the holiday sale price of $12.80, and they’ll also have copies on their December tour. This record is awesome. Instantly knowable melodies. Sometimes I listen twice in one sitting. Best singer in rock, among many other possible superlatives. But wow his voice on this record is so killer. It’s so great that an event record this huge came out this year. It was fun to talk about a record with everyone instead of TV for a change. Happy this saw a proper label release this year so we could include it because we love these guys. Pro-tip for music supervisors: this song will make America feel all of the feels. Sad they called it a day. This record is so special I’m not sure what to say about it other than go listen now and give it your full attention. Produced by our pal John Agnello, who said it was mostly hits. We listened and it was true! Heeeere’s Grace! This song is fire. It’d be even cooler if she sang it in the movie.